Yeah, that duststorm lasted quite a bit, and there were 2 more installments, weaker though. Now it's full summer in Delhi. Raining cats and dogs in Punjab. Dust storms used to be common in Delhi and Punjab, I recall in the 80s and 90s.. but not so severe at times. Only once in 5-10 years you got a severe one where trees fells down, flower pots got displaced a few yards.. I remember one in Faridabad 1982. It took down a tree which was some 400 years old. Now petrol / diesel prices are shooting up, INR going badly down against USD. And RBI forex reserves down for 4th week straight, showing that even near these all-time lows, the INR has been propped up by RBI. Maybe 70+ is coming soon. BTW, there are some 5 threads on Petrol prices. I for one have supported the 'market model' in that and there is no alternative to that. 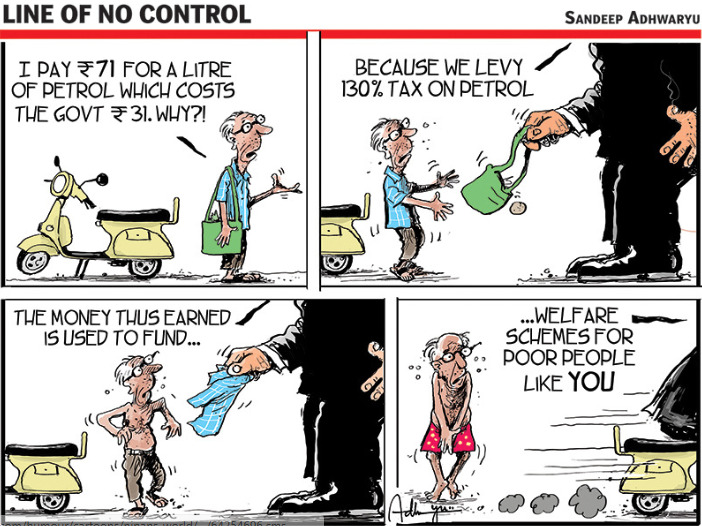 Cong was subsidizing petrol prices for a while and it was leading to Petroleum companies making huge losses. There will be many lifetime highs for petrol prices. When Indira Gandhi came back to power in 1980, petrol prices jumped from 3 rs to 5 rs a litre. That would also have been a lifetime high. BTW, how much does a Kingfisher 650 ml bottle cost in Delhi nowadays? Petrol etc. have always been heavily taxed products, both by the centre and the states. But in the recent past the taxes have zoomed way above, denying the public the benefit of lower international prices. NEW DELHI: For diesel and petrol, it's a record a day every day now. On Saturday, petrol touched the all-time high price since 2013. On Sunday, it beat its previous day’s record. On Monday, it created a new all-time record in Delhi and Mumbai + by touching Rs 76.57 and Rs 84.40, respectively. WHY ARE GLOBAL CRUDE OIL PRICES ON A RISE? Production cuts by oil exporters, shrinking supplies from Venezuela and uncertainty over Iran’s contribution after U.S. decision to exit the nuclear deal + have contributed to rise in crude prices. However, there is a catch. The government might be blaming crude prices for record high petrol and diesel rates, but the last time petrol crossed 76 per litre, five years ago, it was 40 per cent costlier before taxes. Fuel prices have shot up now because of very high taxes. Central tax on diesel has increased more than three-fold, and it has doubled in case of petrol. In 2016-17, the Centre earned 2.7 lakh crore from taxes and duties on petroleum products, which is 117 per cent higher than the 1.3 lakh crore it earned in 2014-15, when NDA came to power. Oil minister Dharmendra Pradhan has indicated that there is scope for relief. On Sunday he said, "The Centre is sensitive towards the rising fuel prices. Various alternatives are being explored. I hope something will work out soon." Most fuel taxes are as percentage of price which means government’s tax earning goes up as price increases. The central government raised excise duty nine times between November 2014 and January 2016+ while it cut the tax just once in October last year. The bottomline thus is, Centre does not have to take a hit on revenue, it just has to be okay with not earning more with every hike. If not, then the next relief may be six months away when the next round of elections is due. ^^ It is the same old regurgitated stuff. If Petrol taxes are lower, the delhi wallas wont be able to breathe. Let me pull up some arguments i was having with Swami RIP. And how much is it in Australia? I went to a dinner at some desi's place last weekend, they had invited another family. So the 2 guys talked IPL and watched highlights most of the time we were there. I said if America took to cricket, their boys would be a great fit.. the guy goes they do have a cricket team in US. Does anybody watch anymore? Or it is only me? You mean does anyone watch IPL? I do. Good entertainment. Or do you mean does anybody not watch anymore? Then I don't. No time. Not many travel by road in the summer season here, but the prices have gone up now for 11th consecutive day.